Pierre Koffmann’s Restaurant on the Roof, aka the latest craze in pop-up restaurants, was originally meant to open for six days only during the London Restaurant Festival. But due to popular demand its run was extended to the end of October. I’ve been a bit slow to jump on this bandwagon, procrastinating about whether I should go or not. But in the end curiosity got the better of the cat, so I finally went this past weekend during what I thought was going to be its final week. However talk by the restaurant staff has it that the restaurant’s run will again be extended until mid-December, although this is still to be confirmed as it’s only in the discussion stage at the moment. My view is that they shouldn’t extend it. Instead, I think they should let the restaurant go out with a bang on the back of all the success and glorified publicity and return in force next year as there’s sure to be another London Restaurant Festival. Another month and a half and there’s the real possibility that the novelty factor will wear thin, although an extended run would give people who haven’t managed to secure a reservation and want to go that opportunity. The marquee that had been set up on the roof of Selfridges for use as the restaurant was cleverly done. If you didn’t know it was temporary, you could easily be forgiven for thinking that it was a permanent structure. However, what was distinctly noticeable as a measure of temporariness was the floorboards shaking every time a waiting staff walked pass our table. The restaurant is predominantly white and elegantly finished. The view is pretty nice although you only get to see the roofs of the surrounding buildings. I liked the touch of the bowler hats that hung along the back wall – very Thomas Crown Affair – and overall the ambience was lovely. But the irresistible draw card has to be the fact that ex-three star Michelin chef Pierre Koffmann of the now closed Le Tante Claire had come out of retirement to cook. A three course meal at Restaurant on the Roof will set you back a fine dining price of £75 before drinks and service. The amuse bouche was tête de cochon (pig’s head), pressed and rolled, which was served with a celeriac and walnut remoulade. This was pleasant but unspectacular. 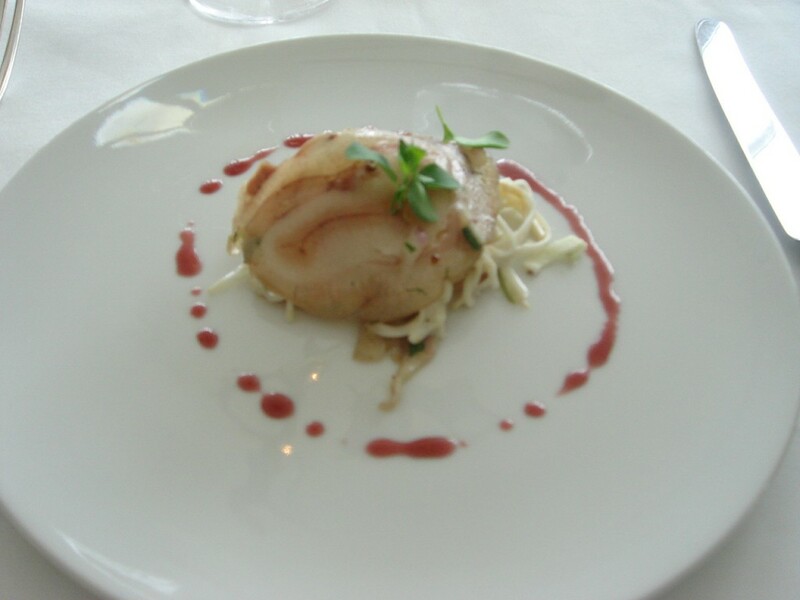 If the highlight feature of the amuse was the tête de cochon, then it was overwhelmed by too much celeriac. A starter of pan fried foie gras with a potato galatte and sauternes jus was well executed. The foie gras was meaty, buttery in texture and unctuous. (Sorry, I simply couldn’t resist the use of this word. My head is filled with recent episodes of Professional Masterchef. By the way, congrats to Steve – the concept of the sweet shop dessert was my favourite.) The jus had been beautifully reduced although the galette could have been a little crispier. 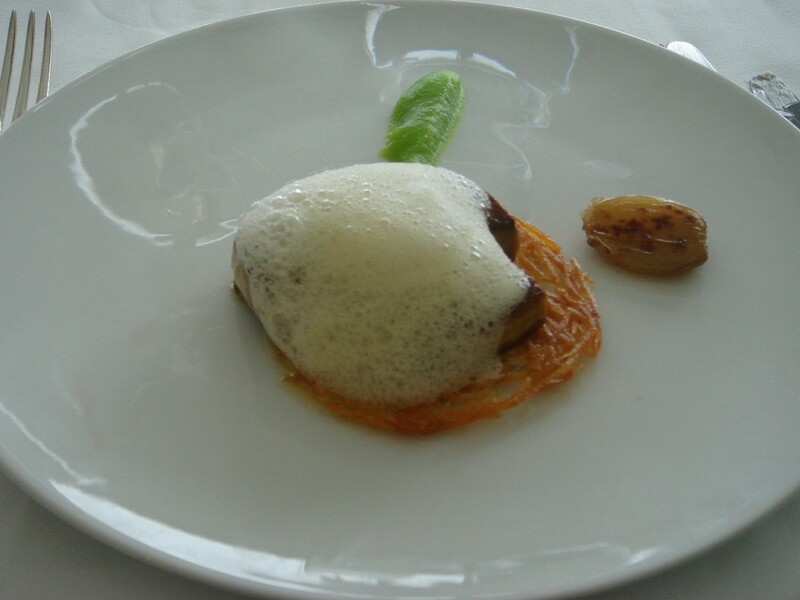 There was also some apple puree which worked well with the foie gras and was not too sweet. This was a very enjoyable dish. 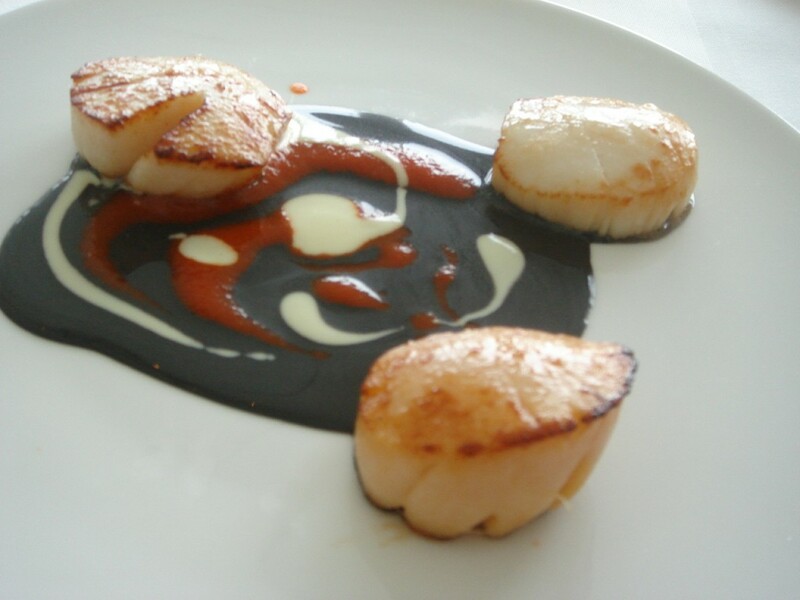 Hand dived scallops with squid ink were plump, juicy and cooked perfectly. The sauce had been reduced nicely, and contained a lovely distinct, yet subtle, flavour of squid ink that did not overpower the scallops. But this dish was very rich, and it needed acidity in it to cut through some of the richness. 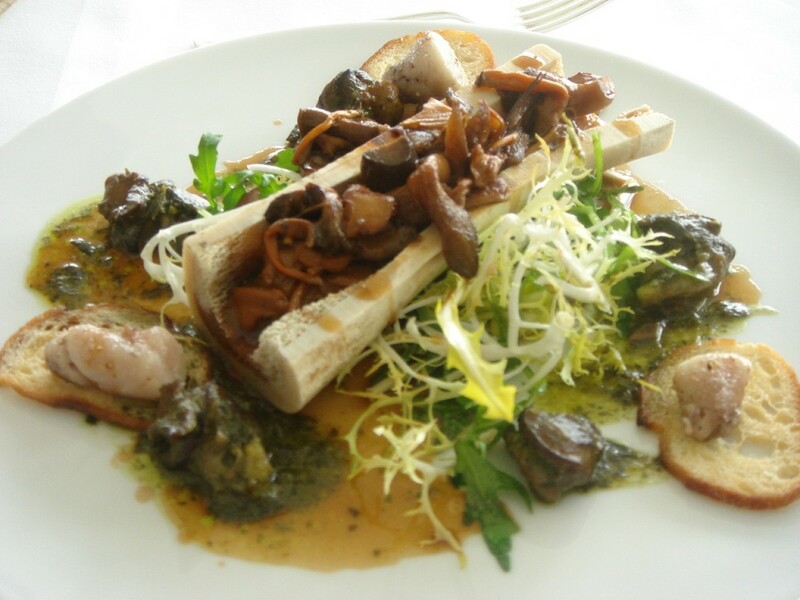 Fricasse of wild mushrooms and snails with bone marrow was pleasant but uninspired. The plate, piled high with ingredients, looked too busy for a fine dining dish. The snails could have done with more browning in the pan for a slightly more robust and crispier finish. The mushrooms were lovely. We were three, and we all ordered pig’s trotter stuffed with veal sweetbreads and morel mushrooms, Koffmann’s signature dish from his good old days. This was a wonderful dish. The pig’s trotter was melt-in-your-mouth tender, and the stuffing of sweetbreads and morels provided a savoury, meatier contrast to the slightly sweet and soft trotter. The mash was creamy and buttery, and the sauce of pork stock, brandy and port reduction was wonderful. It was not too sweet and was of an excellent consistency. 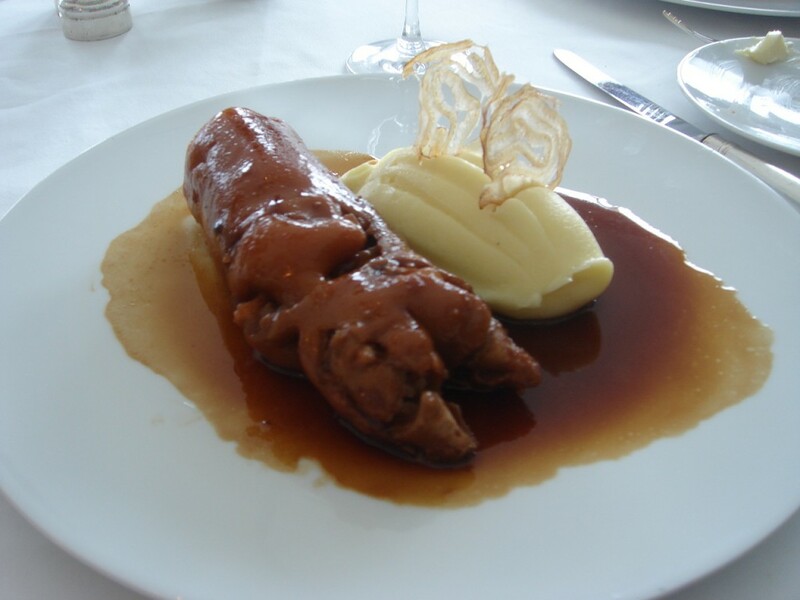 The only drawback was that the tête de cochon slivers, which reappeared in this dish on top of the mash, were a little chewy. 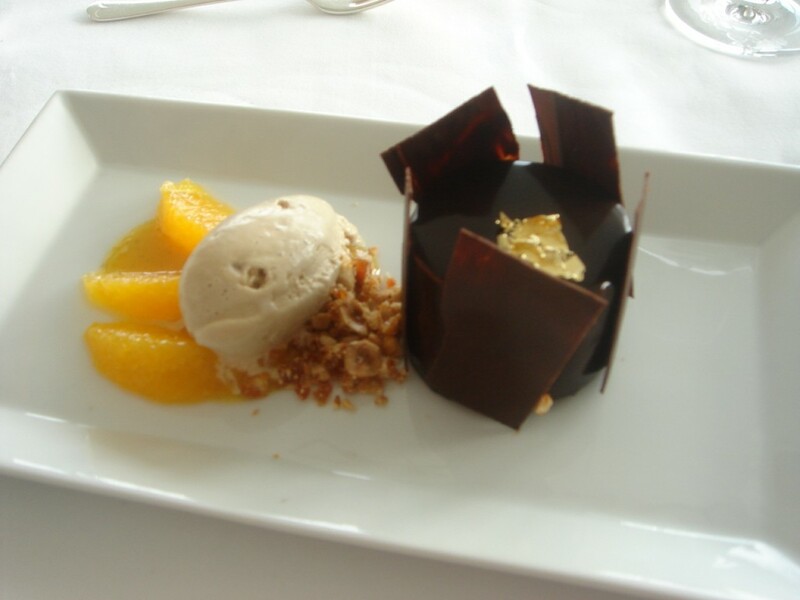 Dessert of Toscano chocolate mousse, orange compot and muscovado ice cream was decadent and delicious. Beautifully presented, the creamy rich mousse had been layered with a thin biscuit which added a touch of crunchiness to the dessert. The ice cream worked well with the mousse, although the orange compot was dull. It needed perhaps a touch of alcohol to lift it. 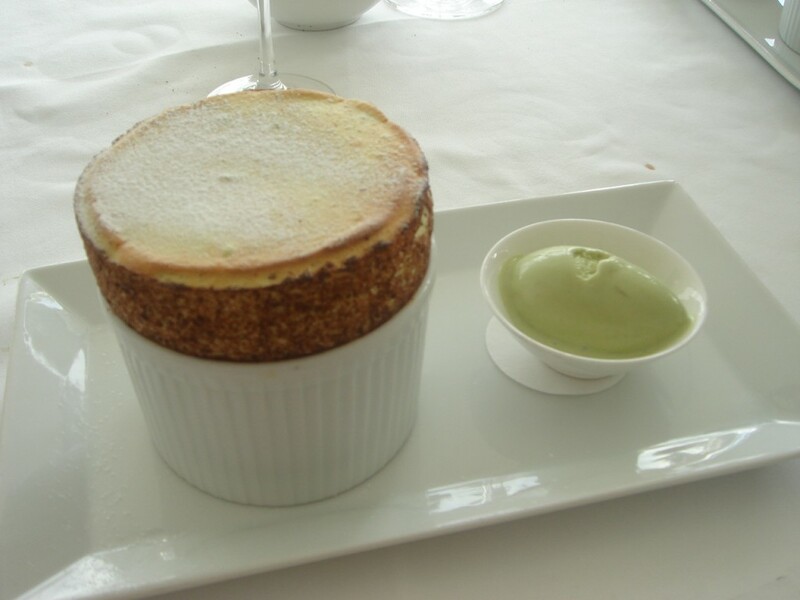 A pistachio soufflé with pistachio ice cream didn’t quite hit the high notes. I requested that the ice cream not be spooned into the soufflé, and consequently it was easier to tell that the soufflé was slightly undercooked. Although passable, it was a little soggy in the centre. The dessert was not too sweet, but it lacked a strong pistachio flavour and was a little too eggy. 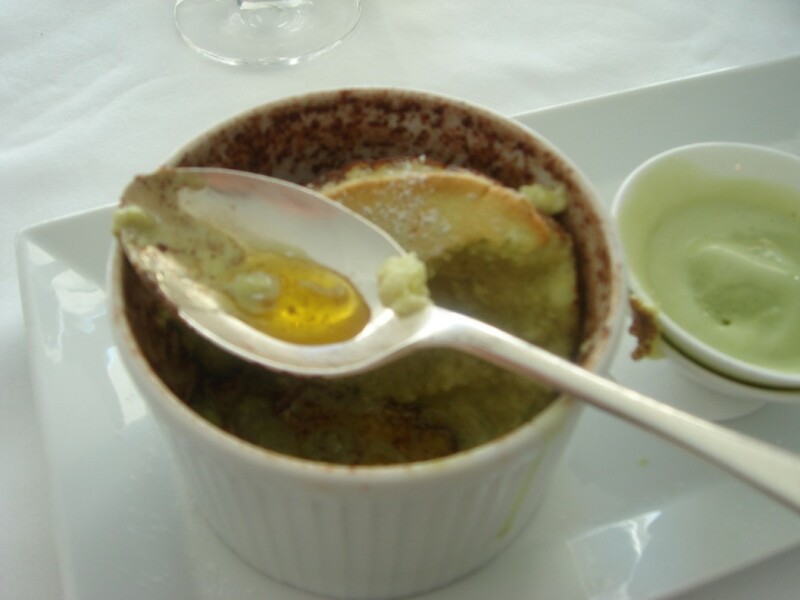 There was also a thick layer of melted butter at the bottom of the ramekin which was a slightly unappealing. 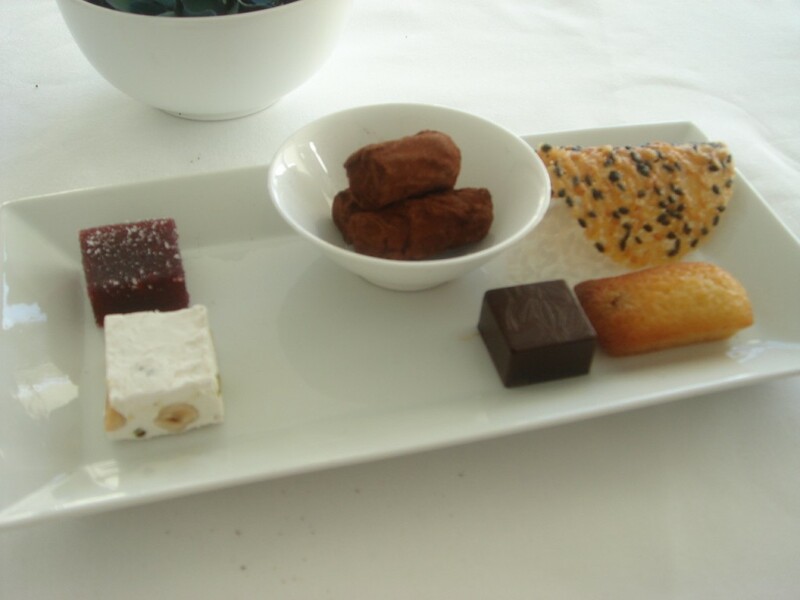 Petit fours were average. The sesame tuile crumbled on contact although the chocolate truffles were delicious. The breads (white, brown, tomato, bacon and onion and sourdough) were fairly good. They were tasty, but the crust could have been crunchier. The service was friendly, attentive and efficient, although there were little details that got overlooked by the staff, which in any other fine dining restaurant might be considered unacceptable. We were not offered sugar with coffees and no effort was made to pour my tea. Overall the food was excellent, well executed and very enjoyable. This was wonderful classic French food with lots of perfectly reduced sauces. But the food was not always perfect and for £75, it was a pricey meal. There is an element in the pricing which serves as a markup for the novelty factor – understandable given that there is a higher initial set-up cost associated with a pop-up restaurant that must then get factored into the food. Comparatively speaking, I can think of a few other restaurants in London where you can get slightly better cooking for the same price or for a little less money. Nevertheless, on balance, I thought the restaurant was worthwhile going to at least once (but maybe not again). I’m really glad I went for it was a lovely experience and it gave me the opportunity to eat food cooked by the famous Pierre Koffmann and to dine at the wonderful setting that was Restaurant on the Roof. £75 for three courses, excludes drinks and service. I have to agree with you here. We had a wonderful time at the restaurant on the roof (especially the Diwali fireworks that were a lovely coincidence) but felt that some of the food lacked the precision of 3 star dining… Definitely an experience to remember though! That souffle definitely doesn’t look right, there was certainly no soggyness to mine, nor butter at the bottom, though it was lovely and moist. The foie gras & the scallops & the trotter sound pretty spectacular! I have just returned from a meal here and have to say although the food was truly excellent, the service ruined it – it was appalling. We waited at the bar for 10 minutes without being offered a drink, the wine (vosne Romanee) never turned up with our main course and when prompted (half way through), they brought the wrong bottle. Water we ordered didn’t turn up and had to be asked for a second time. No one asked how our meal was let alone poured drinks and so it goes on. Great food ruined comprehensively by service bettered by my local pub! My advice is spend your money somewhere proven and established like Le Gavroche and give this a miss.